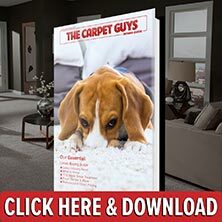 If you need new carpet in Ypsilanti, The Carpet Guys would love to lend a helping hand with your carpet installation. We provide all of our customers with high quality material by the best brand names on the market today. Our aim is to provide customers with new carpeting that they will love for years to come. To receive an amazing carpet installation service for your home, contact The Carpet Guys. Our plush carpeting can dress any room with a beautiful and luxurious look. Decorate any formal setting with this velvet like carpet material. Give any room in the home personality with our casual looking frieze carpeting. Frieze provides a definite flair that can be seen in whatever room it is installed in. Get an interesting underfoot feel by installing our looped carpeting. It comes in many sought after colors, allowing it to compliment almost any type of décor. Add a strong defensive layer to your floors with our berber carpeting. This hard wearing carpet material holds it's own against foot traffic and spills, making it perfect for a busy home. For all of your Ypsilanti carpet needs, our professional installers are here to handle them. No matter what type of carpeting you choose, without proper installation, it will not perform as well as it should. Our Ypsilanti carpet installation is superior, providing you with the installation and performance you desire. Our professional carpet installers are licensed and certified to handle any carpet installation job, and they get it done right. By hiring The Carpet Guys, you can receive the best carpet installation in Ypsilanti that you can find. If you are looking for new carpet and professional Ypsilanti carpet installation, find it with The Carpet Guys. Our expert carpet installers are ready and willing to serve you. Take the time to schedule a free in-home estimate to get started on installing new flooring in your home today. Either schedule an appointment via our website or call us and speak with one of our friendly representatives to set it up. Professional carpet installation and new carpeting in Ypsilanti is only a click away.